I’ve been a fan of Pema Chödrön for a while. She’s been one of the better teachers and writers to come out of Chögyam Trungpa Rinpoche’s lineage of practice and the Shambhala Tradition in the last few decades. Her works seem to be pretty widely read outside of the immediate Buddhist community as well, which is a bit of an accomplishment. I’ve actually done a bit of training in the Shambhala Tradition in the past and it, in a way, acts as an excellent bridge between Tibetan Practice and the West. Trungpa was quite accomplished in bridging cultures. I’ve also found the sitting practice that they teach to be a quite excellent introduction for beginners. "Many of us, without even realizing it, are dominated by fear. We might be aware of some of our fears—perhaps we are afraid of public speaking, of financial hardship, or of losing a loved one. Chögyam Trungpa shows us that most of us suffer from a far more pervasive fearfulness: fear of ourselves. We feel ashamed and embarrassed to look at our feelings or acknowledge our styles of thinking and acting; we don’t want to face the reality of our moment-to-moment experience. It is this fear that keeps us trapped in cycles of suffering, despair, and distress. Chögyam Trungpa offers us a vision of moving beyond fear to discover the innate bravery, trust, and delight in life that lies at the core of our being. Drawing on the Shambhala Buddhist teachings, he explains how we can each become a spiritual warrior: a person who faces each moment of life with openness and fearlessness. 'The ultimate definition of bravery is not being afraid of who you are,' writes Chögyam Trungpa. In this book he offers the insights and strategies to claim victory over fear." 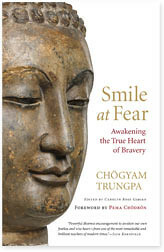 "The 'Smile at Fear' retreat is a rare opportunity to practice and study with Pema in real time, as she teaches wisdom learned from her own teacher, Chögyam Trungpa. Using his book of the same title, she shows how to approach the things that scare us in a radically different way than we're accustomed to, and in doing so to discover how astonishingly insignificant fear really is—and how surprisingly simple it is to access the heart of fearlessness. These are Buddhist teachings and practices that can become resources for a lifetime." Given how many people are interested in her work and how few of us live in California (or, like me, are in California but cannot attend since it is sold out), this isn’t a bad option at all. It’s basically $60 for access to roughly fourteen hours of teaching by Pema Chödrön which is a pretty good deal. You can sign up at the event site over at Shambhala Publications. Shambhala Publications has helpfully offered to give two tickets to the online retreat away to readers of this blog. If you’re interested in attending, please post a comment about why you’d like to attend and maybe some anecdote about how Buddhist or meditative practice has impacted your ability to work with the difficulties we encounter day to day. I’ll pick two people (assuming there are more than two) from the responses. 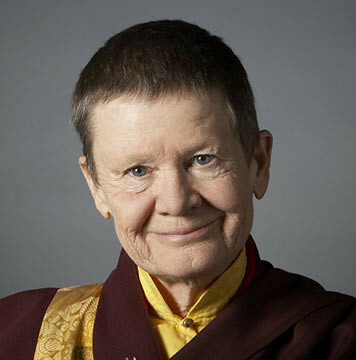 If you want to know more about Pema Chödrön, you can watch a wonderful interview with her by Bill Moyers below or over here.